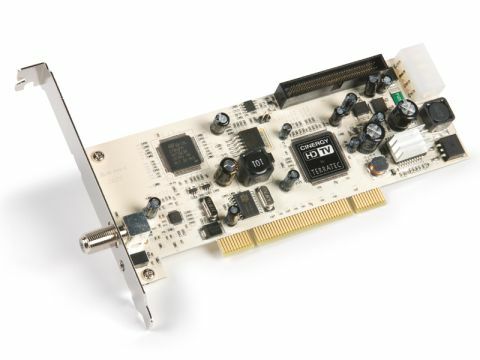 This internally fitting PCI card can be seen as a cross between the Hauppauge WINTV NOVA HD S2 and Azurewave AD-SP400. In the form supplied, it's a Hauppauge-style Windows DVB-S/S2 tuner with provision for remote control – courtesy of the supplied trailing infrared sensor (which plugs, like your dish, into the rear panel) and a handset. This drives the application software; Terratec's own 'Home Cinema' package, as far as the S2 PCI HD is concerned. Among its features are standard-def/HDTV reception, editable recording (native or DivX, etc), timeshifting, multiple-tuner support, subtitles, favourites lists, teletext, picture-in-picture and a searchable EPG. It supports the internet-delivered tvtv EPG (a year's free subscription is supplied). Also supplied is Magix Movies, for transferring content to DVD, and a package that allows the handset to operate other software. Like the Azurewave, a ribbon cable connects an optional CI module. This device, which is also available in a money-saving pack with the tuner card, sits in a second PCI slot. Where it differs from both of the previously covered cards is that no support for Windows MCE is offered. Unfortunately, the comprehensive-sounding Home Cinema software locked up our Vista machine and failed to work. We then downloaded the BDA drivers from Terratec's website, and used those to get the S2 PCI HD working with DVBViewer Professional. Here, we had complete success – and some very commendable results. First of all, the S2 PCI HD/DVBViewer combination has an unexpected characteristic – it's faster than many dedicated receivers. A full scan of Astra 1x's transponders was completed within a minute-and-a half. For Astra 2x, our wait was just over three-and-a-half minutes. Quite superb, in other words. With DVBViewer we achieved excellent results from TV channels – hi-def or otherwise – and radio stations alike.